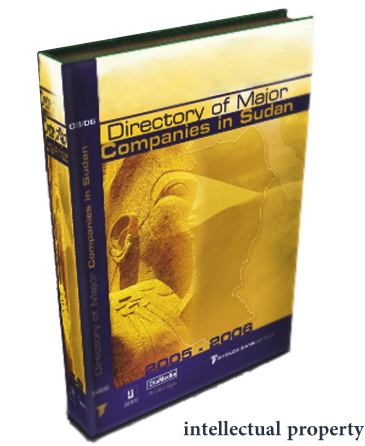 Directory of Major Companies in Sudan 2005/6. To relay the true image of Sudan to the world. To promote Companies, Institutions & Organizations worldwide. * Compiled by: Paul Hormez Azzo (Cavaliere). 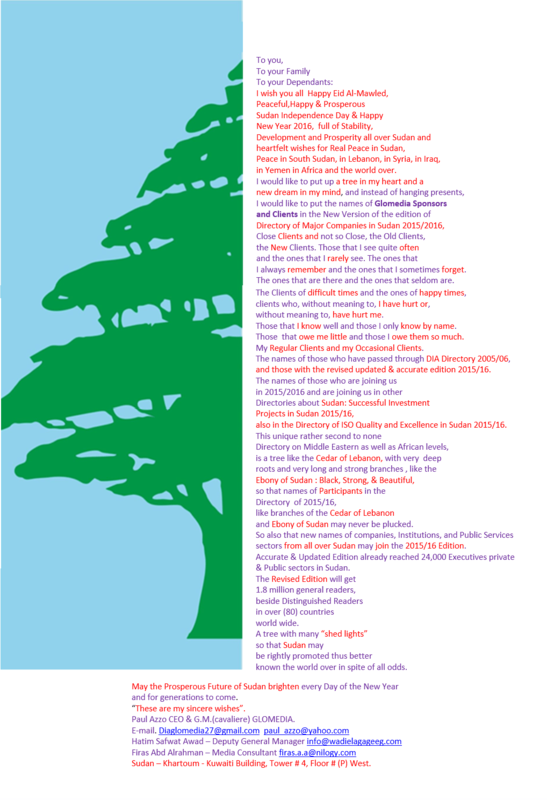 * Project Executed by: (5) Lebanese & Sudanese Media Experts. * Texts worked on by: Scholars, Consultants & Professors. * Total Qty. of Distribution: (5,000) within 1st year from publishing..
* Over (400) Major Companies, Institutions & Organizations. * Over (2,500) valid & important addresses. * UN offices, NGO’s, Embassies, Chambers of Commerce and the like. * Number of pages: (400 circa). * Paper size: A4, color. * International Conferences & Exhibitions. * Website: Links to various websites. Points of Sale, Bookshops & Major Hotels. Fairs, Exhibitions, Seminars, Cultural & Social Clubs. Conferences, Fairs & Exhibitions in Sudan. United Nations Offices and the like. – Highly ranked officials of the Public Sector. – Executives of the Private Sector. – Foreign Embassies in Sudan and respective countries. – UN Offices and respective Head Offices in various countries. – International Organizations & Head Offices in various countries. – NGO’s & Head Offices in various countries. – Major Sudanese Companies & their Agents &/or Principals. on 27/12/1979 by the then President of Italy, late On. Sandro Pertini. in Italian for Gulf Countries and beyond. him on 27/12/1979 by the then President of Italy, late On. Sandro Pertini. Our Motto: “As grows Promotion so grows the Nation”. Sudan – Khartoum – Nile Street – Kuwaitia – Tower # 4, Floor # (P) West.